Gallia Academy senior Tanner Allen wraps up an Ironton defender as teammate Cade Roberts (34) gives chase during a Week 9 football contest in Gallipolis, Ohio. 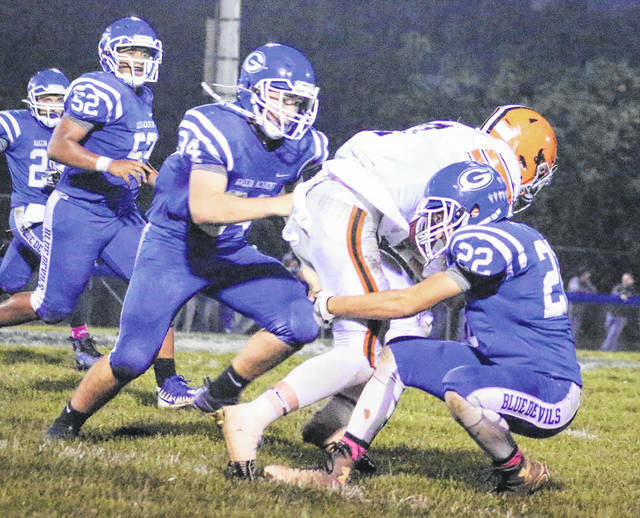 Last Week: Gallia Academy defeated Ironton 38-20, in Gallipolis; South Point lost to Portsmouth 39-0, in Portsmouth. Last meeting between the teams: Oct. 28, 2016. Gallia Academy won 40-24, in Gallipolis. GAHS offense last week: 385 rushing yards, 40 passing yards. SPHS offense last week: N/A. GAHS offensive leaders last week: QB Justin McClelland 5-11-0 40 yards, 1TD; RB Boo Pullins 29 carries, 188 yards, 3TDs; WR Caleb Henry 1 reception, 19 yards. GAHS defense last week: 166 rushing yards, 121 passing yards. 1. South Point’s last win over Gallia Academy came on Sept. 13, 1996. The Pointers won that game by a 21-14 final and the teams didn’t play again for 20 years. 2. Along with the six other Ohio Valley Conference teams, South Point and Gallia Academy also have a common opponent in non-league play, in River Valley. South Point lost to all-7 common opponents, while GAHS defeated four of the seven, River Valley, Ironton, Chesapeake and Portsmouth. 3. The Pointers enter the game with a 2-3 home record, while Gallia Academy brings a 1-3 road mark. GAHS is one of five OVC teams with a 4-5 record entering Week 10. 4. Through nine games, the Blue Devils have 2,001 rushing yards and 1,253 passing yards. The Blue and White are averaging 18.5 first downs per game and 30.6 points per game. 5. GAHS junior Justin McClelland is the team’s leading rusher and leading passer at this point in the season, rushing for 655 yards and eight touchdowns, while passing for 1,251 yards and 10 touchdowns. Four Blue Devils have double-digit receptions this season, led by Garrett Burns with 22 grabs for 283 yards and two scores. Last Week: River Valley lost to Athens 39-7, in Bidwell; Waverly defeated Minford 49-7, in Waverly. Last meeting between the teams: Oct. 28, 2016. Waverly won 49-14, in Bidwell. Current head-to-head streak: Waverly has won 1 straight. RVHS offense last week: 42 rushing yards, 63 passing yards. WHS offense last week: 293 rushing yards, 201 passing yards. RVHS offensive leaders last week: QB Jordan Burns 10-19-3 63 yards; RB Gabe Stapleton 7 carries, 61 yards, 1TD; WR Dustin Barber 5 receptions, 39 yards. RVHS defense last week: 280 rushing yards, 250 passing yards. WHS defense last week: 43 rushing yards, 115 passing yards. 1. River Valley is 5-16 in its last 21 season finales. The Raiders’ 2014 victory over Northwest is their most recent win to close out the year. 2. All three of Waverly’s losses have come against teams that are now 9-0, in Nelsonville-York, Portsmouth West and Wheelersburg. NYHS is the only common opponent between the Raiders and Tigers, with the Buckeyes defeating RVHS by a 49-7 final and WHS by a 38-13 margin. 3. With one game remaining in the 2017 season, River Valley has averaged 138 passing yards 117.9 rushing yards per game. RVHS has earned 14.4 first downs per game and is scoring 16.4 points per game. 4. River Valley’s top rusher and passer to this point in the season is Patrick Brown, who, despite missing last week, has 471 rushing yards and three touchdowns, along with 1,150 passing yards and nine touchdowns. Layne Fitch is the team’s leading receiver with 33 catches for 401 yards and three scores. 5. While River Valley is already eliminated from playoff contention, Waverly is currently eighth in Region 16 and is one of five teams entering Week 10 with a chance to grab the final playoff spot. The Tigers made their fifth all-time postseason appearence last season. Last Week: South Gallia lost to Southern 48-0, in Racine; Miller lost to Wahama 14-7, in Mason. Last meeting between the teams: Oct. 28, 2016. Miller won 46-13 in Mercerville. SGHS offense last week: 78 rushing yards, 12 passing yards. MHS offense last week: 160 rushing yards, 67 passing yards. SGHS offensive leaders last week: QB Jaxin Mabe 1-2-1 12 yards; RB Kyle Northup 18 carries, 62 yards; WR Austin Stapleton 1 reception, 12 yards. MHS offensive leaders last week: QB Colby Bartley 5-12-1 57; RB Blayton Cox 10 carries, 51 yards; WR Blayton Cox 4 receptions, 47 yards. SGHS defense last week: 236 rushing yards, 90 passing yards. MHS defense last week: 223 rushing yards, 39 passing yards. 1. In the all-time series, South Gallia holds a 9-8 edge over the Falcons. Since joining the TVC Hocking season, South Gallia is 5-2 against Miller. 2. Last season’s MHS victory over South Gallia was the first time in over a decade that Miller ended the year with a win. SGHS had won four consecutive regular season finales prior to last year. 3. The Rebels’ last trip to Hemlock resulted in a 61-26 win on Oct. 30, 2015. That is the last time SGHS defeated a team that entered with a winning record. Last Friday was the first time Miller fell to a team that entered with losing record since Oct. 23, 2015. 4. The Rebels have lost five straight games, their longest losing skid since 2012. During the current skid, SGHS has been outscored by a 237-to-47. 5. Over the past two games, South Gallia was led by Kyle Northup with a combined 58 carries for 236 yards and one touchdown. Northup has a team-high eight rushing scores this fall, while throwing for one score.